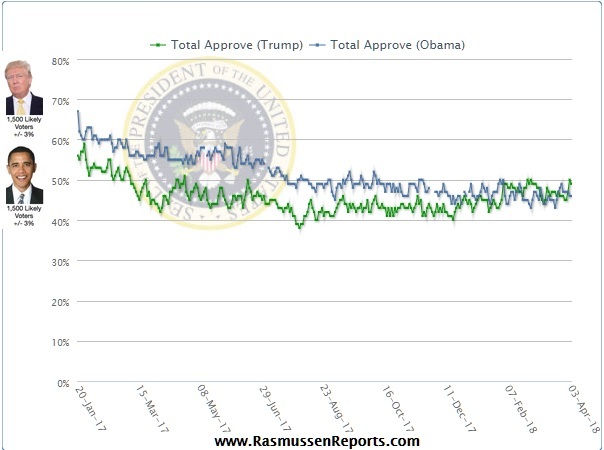 On April 2, President Trump reached a watershed moment when the latest Rasmussen tracker showed that his approval rating had reached 50% for the first time during his tenure as Commander-in-Chief. And perhaps even more interesting, this rating for Trump is higher at this stage of his Presidency than it was for Barack Obama's was during his second year in office. But in addition to this daily Presidential tracker there was another poll taken that doesn't appear to be getting much traction, but could be vital for the upcoming 2018 Midterm elections. And that poll is one which shows that 38% of Registered Republicans believe that GOP Senators are a bigger obstacle to 'Making America Great Again' than Democratic ones are. Approval ratings for Congress as a whole have not been good for more than a decade, and this disparity has only gotten worse with the election of Donald Trump who is just as much a phenomenon with the American people as he is an iconoclast. And with the President having already established his willingness to call out or vilify even the top leaders in the House and Senate for their perceived incompetencies, Republicans in November may find themselves battling their constituents just as much as their Democratic opponents in their battle to try win re-electtion.